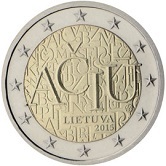 Lithuania joined the Eurozone in 2015 and is therefore its latest member. 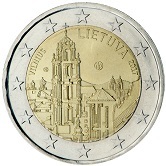 Although the standard Lithuanian Euro Coins only have one motif, it is very imposing. Some basic facts relating to Lithuania. 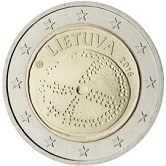 Unfortunately Lithuanian Euro Coins, like those of Ireland, have only one motif for all eight coins. There is however a minor variation as described below. 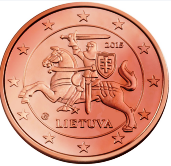 For all coins the motif is the state coat of arms, the "Vytis" - this a fighting knight mounted on a horse and swinging a sword over his head as he presumably attacks the enemy. 10 cent,20 cent and 50 cent coins - the outer circle ring has horizontal lines. 1 Euro and 2 Euro coins - the outer circle ring has vertical lines. 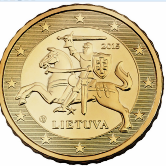 The name of the country in Lithuanian - "LIETUVA" - also appears on all coins. 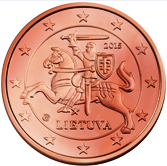 1 Cent -"Vytis" - Lithuanian Coat of Arms. 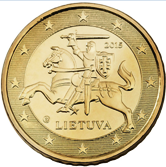 2 Cent -"Vytis" - Lithuanian Coat of Arms. 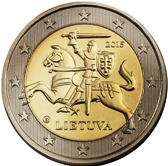 5 Cent -"Vytis" - Lithuanian Coat of Arms. 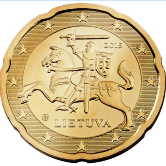 10 Cent -"Vytis" - Lithuanian Coat of Arms. 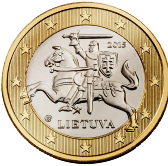 20 Cent -"Vytis" - Lithuanian Coat of Arms. 50 Cent -"Vytis" - Lithuanian Coat of Arms. 1 € - "Vytis" - Lithuanian Coat of Arms. 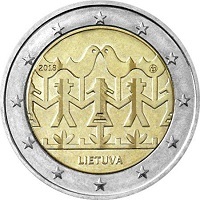 Lithuanian Commemorative Two Euro Coins. 2018 - Dance and Song Festival. 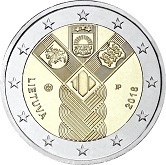 Return from Lithuanian Euro Coins to Links to Specific Countries. Return from Lithuanian Euro Coins to euro coin collector.